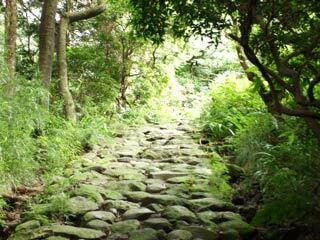 Hakone Old Road (箱根旧街道) is one of Tokaido Road located in Hakone. It is 23rd RI (approximately 100km from Nihonbashi, Tokyo). Ichirizuka, the Japanese milestone, of Hakone is the only one remains in Tokaido Road. Also, Ishidatami, the stone floors are also remains since Edo period. There is no parking and restroom. It is one the Hakone Tokaido Hiking course. Hakone Old Tokaido Road is preserved in a great condition. It has not change since Edo period. If you want to feel the real atmosphere of Edo period, this road give you the feeling because most of famous samurai during Edo priod, walk on this road. Ishidatami, a stone floored road, is a heavy-duty road for this kind of mountain, and this road was constructed in early Edo period. It made of two layers, one with small stone and the other is larger stone. Because Hakone has lots of rain, this structure of the stone road was designed to stay strong under the heavy rain. Today, those stones built in early Edo period are still remain.